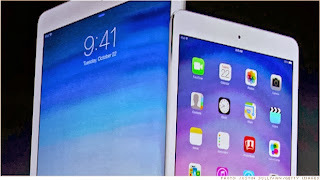 The new eight-inch iPad mini now matches the larger iPad Air in processor power, screen resolution and battery life. It runs all the same apps.But the iPad mini has two things that make it more attractive to many consumers than the iPad Air: It's easier to handle, and it's $100 cheaper. Even though the iPad mini's screen is a third smaller than its full-sized counterpart, Apple bumped its screen resolution to a "Retina display." That will lessen the already minor impact of staring at a smaller screen.By putting the smaller iPad mini on level ground with the iPad Air, Apple tacitly announced that it is focusing its tablet strategy on the iPad mini. Despite all the marketing theatrics surrounding the iPad Air, make no mistake about it: the iPad mini is THE iPad now.